Target has always been one of my favorite stores for their great selection and low prices, and this spring there's even more reason to shop there. They're teaming up with Procter & Gamble to sell specially marked "red" P&G products like Swiffer, Tide, Downy and Bounce that benefit St. Jude Children's Research Hospital. Just think, you could be helping in the fight against childhood cancers just by doing your spring cleaning! From May 10 through June 13, Procter & Gamble and Target stores invite you to clean your own house like Target House and help St. Jude Children’s Research Hospital in its fight to find cures and save children battling deadly diseases -- simply by purchasing specially-marked “red” Procter & Gamble products at Target. 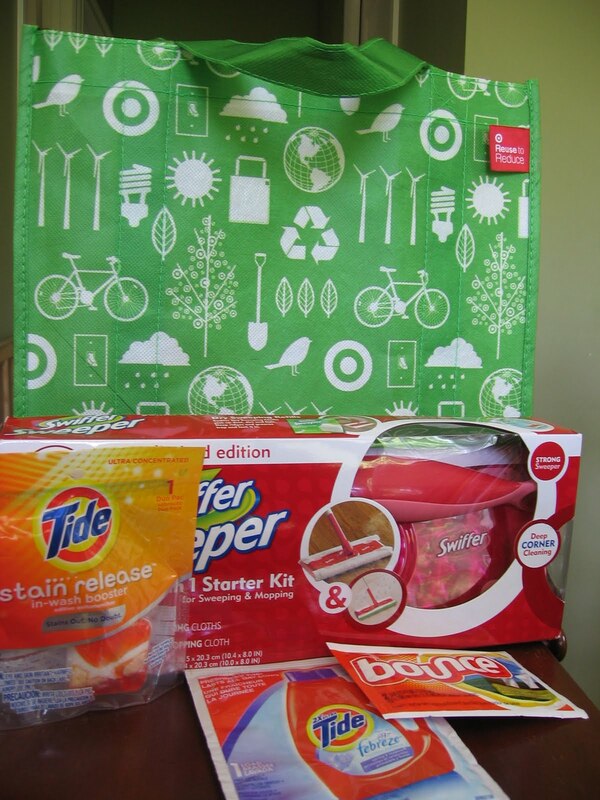 Target will donate fifty cents for every specially-marked “red” Swiffer® Wet Jet® and Swiffer Sweeper® Starter Kits as well as twenty-five cents for every specially-marked “red” Bounce®, Downy®, and Tide® from May 10 through June 13 at Target stores for a total of up to $250,000. St. Jude is one of the world’s premier centers for the research and treatment of pediatric cancer and other catastrophic childhood diseases. In addition to the donation to St. Jude, P&G will provide St. Jude patients and their families with these same P&G products to use throughout their stay at Target House and other St. Jude residential facilities in Memphis. Tell me which Procter & Gamble products you regularly buy at Target (or which ones you'd like to buy). This entry must be completed before extra entries qualify. This giveaway ends at midnight PST on May 30, 2010; I will draw 2 winners at random on May 31 and post the winner's name after the winner confirms acceptance. For additional giveaway rules, click here. Good luck! Disclosure: . I received a product sample, but was not paid to review the product or give my opinions. Unless clearly stated, the views and opinions expressed here are my own. I regularly buy Swiffer Sweeper Wet Mopping Refills at Target! I LOVE TARGET!! I only use Tide Free HE laundry detergent and I always buy it at Target. I love that store! I buy Tide to go at Target a lot they are pretty cheap there. I also buy my swiffer duster. I buy Tide coldwater at Target. I subscribe to Bonggamom finds. we always buy tide coldwater! We buy Febreeze. What can I say - I have a teenager! I love Febreeze, it freshens up everything! 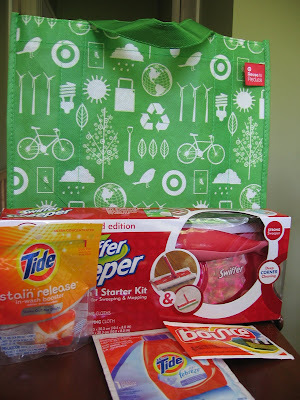 we buy the tide sensitive laundry detergent at target! My favorite P&G product that I buy most often is Tide laundry detergent. I always buy my Tide laundry detergent and Swiffer Dusters at Target. We buy our Tide products at Target all the time, they have the best prices! I also buy duracell batteries. I regularly buy Tide and Downy. I always buy swiffer and I sometimes buy Tide when it is on sale. I buy Downey and Swiffer Wet Jet refills. My husband says I take cleaning to the extreme!! I buy myu Swiffer supplies at Target. Thanks! I buy my Iams dog food at Target. Tide, Downy and Cascade. Thanks for the giveaway. Tide and Febreeze for us! I buy Tide at Target quite often- there's always a good sale. I usually buy Tide at Target. I buy the free and clear bounce dryer sheets. Thank you! I buy Cascade dishwashing soap at Target! We buy Tide Direct Foam dish washing soap! It's the easiest way to wash dishes and save money!!!! I buy Tide and Tide Stain Release at Target. I buy Tide products and Swiffer dry duster refills at Target. I buy the bounce dryer bars and love them! My son has allergies and we always buy Tide at Target because it doesn't bother him. I buy the Swiffer dusters. I really like them. I have wanted to try Tide's Cold Water formula detergent, but haven't yet. I really like Target, as well. I aubscribe to Bonggamom Finds updates via email. I buy Febreeze all the time at Target, thanks! I buy tampax from target. We get our swiffer refills at Target! We buy Tide and Swiffer refills for the duster. I get Febreze and Downy at Target. I regularly buy the Dawn Power Dissolver. I won't leave home without my Tide-To-Go pen! I usually get my Tide, Downy and Dawn at Target. My biggest purchase is Tide. Between my husband & 3 grandchildren I'm constantly doing laundry. I use Swiffer and Tide pretty frequently and get them at Target. I usually buy tide at Target.. I LOVE target! I buy the Swiffer Dusters at Target. I buy Tide at Target. It's getting harder and harder to find the Original Scent Tide. I guess most people's noses aren't as sensitive as mine and they don't sneeze when somebody's clothes have been washed in the Mountain whatever and Ocean whatever scents like I do. i normally buy cheer laundry detergent. We use a lot of Tide! We use Tide when it's on sale, and Febreze as well. Bounce and Tide are two products I buy regularly at Target.